I'm a work-at-home-mom to Stephen (May 22nd, 2000), Sophia (October 2nd, 2003), and Susan (Dec. 27, 2007), all born at home with a midwife. I started sleeping baby productions when Stephen turned one in 2001 -- before that, I had taken him to work with me at UNH (I did web design and public outreach for the Experimental Space Plasma Group), but when he turned one, he was far too interested in getting into the various cables and electronic equipment in the lab (! ), so I began working on web design from home. I started sewing slings before Stephen was even born. I had read William Sears' "The Baby Book" and the idea of babywearing really appealed to me, but I didn't like the look of the padded slings on the market. I bought a MayaWrap pouch in February of 2000, but the one I bought was too small for me then, so I made a larger one out of muslin. 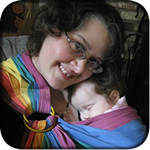 Back in 2000, the sling market consisted mainly of MayaWrap, the Over the Shoulder Baby Holder, and New Native. There were a few smaller WAHMs even then, but that was also before Google, so I never found them. I soon realized that I'd want something adjustable, but didn't have the cash to buy another MayaWrap sling... and it was probably a good thing I didn't! I wanted a way to get the fabric through the rings that would allow it to spread wide over my back, but still look attractive and finished in the rings. My first slings used a regular pleat, like what you'd use to make a kilt or drapes, and the shoulder was really wide -- sometimes up to 15". I tried a number of different fabrics, and made a few slings for friends, all of whom said the shoulder was too wide. So I switched to an overlapping pleat (which allows the fabric to spread evenly over my back, without completely overwhelming my shoulder and upper arm), added the slings and directions to part of my personal website (that was in February of 2001), and got a couple of orders a month that way. Word of mouth spread, and soon I was getting as many as four orders a month. Until 2002, the sling part of my business was the offshoot, and I considered web design to be my primary job; but I soon realized I was spending far more time sewing than working on the computer, and I reorganized my website accordingly.